"I have always supported the goals of Code Next." 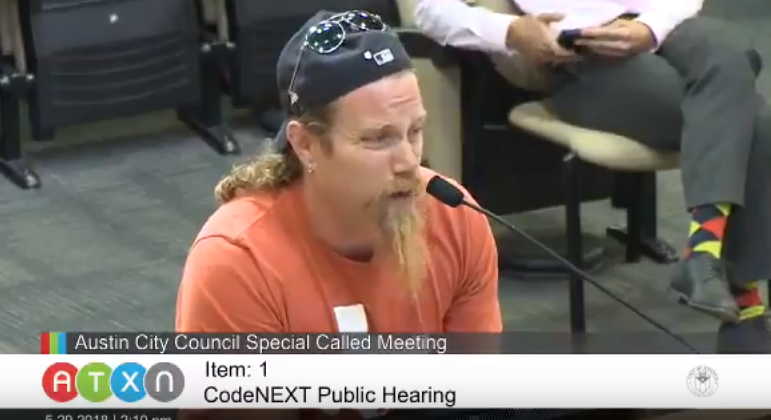 "I think Code Next offered a unique opportunity to lower housing costs, improve our transportation situation, and do so in a way that's consistent with our environmental goals." "Unfortunately, it doesn't really look like that's happening." "In it's current design, Code Next is...a bad policy wrapped in an even worse process." "Frankly, I'm disgusted by the whole thing." Policy: "[D]raft 3 (and everything we've seen up to this point) basically entrenches the current code in slightly different language." "It's not really fundamentally changing anything." Concerned about possible working conditions/wage and benefit mandates getting added late in the process. Process: "That stunt you guys pulled last Thursday, you should be ashamed." "That was an appallingly lawless act." "The state statute is crystal clear." "This is the initial adoption of a zoning ordinance." "State law on this topic could not be more clear." "Honestly, the six of you who voted the way you did on that petition campaign should be criminally prosecuted." "[T]hat will obviously never happen in this county."